In death, we only know her as a mother of five who fell four storeys, and as wife of a British diplomat posted at the UN in New York. The Telegraph’s news account is headlined “Lord Hurd‘s daughter-in-law plunges to death …” Her father-in-law was Douglas Hurd, a former foreign secretary for the UK’s diplomatic service. The news stories also made mention of the apartment where the Hurds lived — “available for rent last year at $15,000 (£10,000) a month.” As if somehow, what — that an expensive rental should go with a perfect life? There was no mention where she had been, what she was like, what were her dreams — only that she was a wife of a diplomat, and is now dead. Catherine Hurd, who is thought to have been a mother of five, fell the four storeys from the top of the building where she lived with the former foreign secretary’s son Thomas, a British diplomat. Mrs Hurd, 46, left no note but New York police are believed to be treating the case as a suicide. “All we can say is that no criminality is suspected,” a spokesman told The Daily Telegraph. It is thought Mrs Hurd was due to return to London next week as her husband, 45, is at the end of a stint working as a senior British official at the UN. He is described as a “political counsellor”. Mr Hurd is a former investment banker and was a contemporary of David Cameron’s at Eton and Oxford, where he was two years ahead of the Prime Minister. He read Arabic and Modern Middle Eastern studies at Oxford between 1983 and 1987 and worked for Credit Suisse First Boston before joining the Foreign Office in 1992. For the past few years he has been in New York, where he is listed as working for the British delegation on the UN security council, specialising in the middle east, G20 and Africa. His father was one of the Conservative government’s most senior figures in the 1980s and 1990s. He served both Lady Thatcher and John Major as foreign secretary, after also serving as home secretary. This is not the first suicide of a diplomatic spouse in the FCO. In the early 1970’s a wife of a British foreign service officer committed suicide. According to Cynthia Enloe in Bananas, Beaches and Bases , a book making feminist sense of international politics (and where there is one large section just on diplomatic wives), the unnamed wife was believed to have committed suicide due to the loneliness and lack of support she encountered upon her return “home” to the UK. Her suicide shocked the UK Treasury’s Medical Officer that he set up networks of women volunteers in different parts of the country to help foreign service wives readjust to life in Britain. No one can say why she walked off that ledge on Saturday. Catherine Hurd did not leave any note behind. Even in death, she appears to stay true to the ancient “never complain” ethos of diplomatic life. Catherine Hurd, rest in peace. Ambassador Anne W. Patterson holds the rank of Career Ambassador in the Senior Foreign Service and most recently served as U.S. Ambassador to Pakistan from July 2007 to October 2010. Prior to serving as U.S. 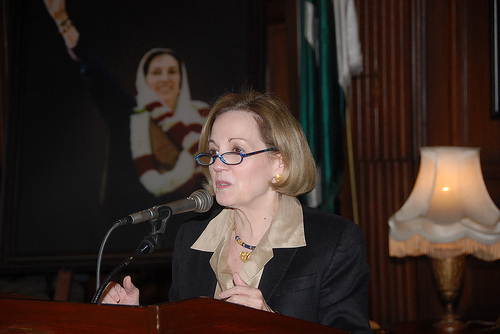 Ambassador to Pakistan, Ambassador Patterson’s recent assignments have included: Assistant Secretary for International Narcotics and Law Enforcement Affairs, Deputy Permanent Representative and Acting Permanent Representative at the U.S. Mission to the United Nations, Deputy Inspector General, U.S. Ambassador to Colombia and U.S. Ambassador to El Salvador. Ambassador Patterson has received numerous honors and awards for her service, including the Secretary’s Distinguished Service Award in 2008 and 2010, and the Ryan Crocker Award for Expeditionary Diplomacy in 2009. Ambassador Patterson received a B.A. from Wellesley College and joined the Foreign Service in 1973. Ambassador Patterson has been rumored to be under consideration to succeed Bill Burns as Under Secretary of State for Political Affairs or “P”. So now there’s officially one less name in the running. For the names floated around as “P” contenders, see Laura Rozen’s piece in The Envoy here. If confirmed, Ambassador Patterson would succeed career diplomat, Margaret Scobey who has been the US ambassador to Cairo since 2008. Joyce A. Barr is a career member of the Senior Foreign Service and currently serves as International Affairs Advisor and Deputy Commandant for the Industrial College of the Armed Forces at National Defense University. Prior to this assignment, Ms. Barr served as Executive Director for the East Asian and Pacific Affairs Bureau at the Department of State from 2007 to 2009 and as U.S. Ambassador to Namibia from 2004 to 2007. Since joining the Foreign Service in 1979, Ms. Barr has held numerous assignments both in Washington and abroad. Her overseas experience includes assignments in Malaysia, Turkmenistan, Sudan, Kenya and Sweden. In Washington Ms. Barr’s assignments have included: Recruitment Officer in the Bureau of Personnel, Human Rights Officer for the Middle East and South Asia in the former Bureau of Human Rights and Humanitarian Affairs, and Desk Officer for the U.N. Industrial Development Organization and the World Tourism Organization in the Bureau of International Organizations. Ms. Barr holds a B.A. in Business Administration from Pacific Lutheran University, an MPA from Harvard University, an M.S. from the Industrial College of the Armed Forces at National Defense University and an Honorary Doctorate from Pacific Lutheran University. According to the Historian’s Office, the Department of State created the position of Assistant Secretary of State for Administration during a general reorganization in December 1944, after Congress authorized an increase in the number of Assistant Secretaries in the Department from four to six (Dec 8, 1944; P.L. 78-472; 58 Stat. 798). The reorganization was the first to designate substantive designations for specific Assistant Secretary positions. The title for this position has varied over the years. Assistant Secretaries for Administration have supervised a variety of functions ranging from budget and personnel matters to foreign buildings and record keeping. Several of these functions, such as accounting and diplomatic security have become the responsibility of newly created bureaus. The Assistant Secretary of State for Administration or “A” has been left vacant since the departure of Rajkumar Chellaraj, a Bush II political appointee from Texas assigned to the bureau from May 30, 2006 to January 20, 2009. If confirmed, Ambassador Barr would assume the position after Steven J. Rodriguez who has been serving as Acting Assistant Secretary for “A” since January 2009. She would report to the Under Secretary for Management Patrick Kennedy.